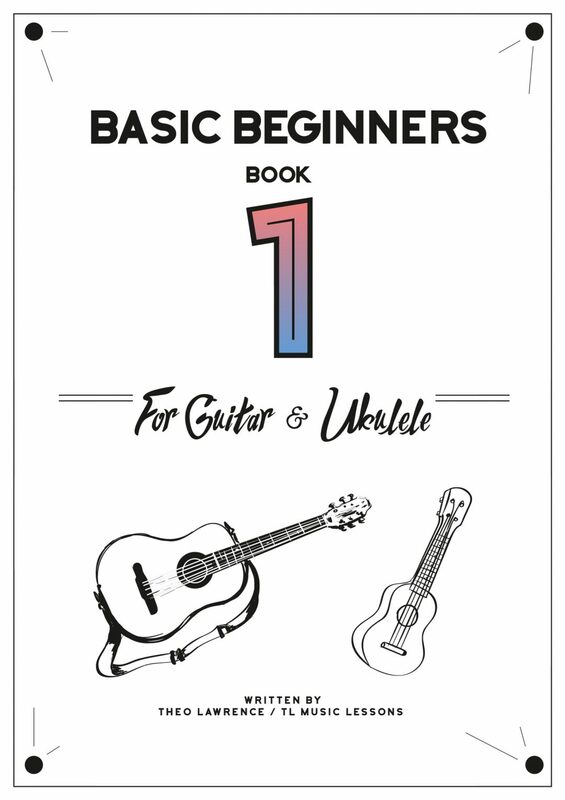 Since writing this ebook, I have developed some ‘Easy Reading’ guitar and ukulele scales and melodies ebooks, so although this page says ‘Book 1’, you might want to take a look at those easy reading books first, especially for younger players. 2 for 1: The premium download includes 1 book for guitar and 1 book for ukulele. 17 topics of study for guitar and ukulele that is aimed at complete beginners. The book has a mixture of public domain songs, easy scales, easy melody exercises and easy chord exercises. The books are designed so that even age 5 or 6 could play some of the pieces and exercises, so it starts off very easy with simple melodies such as Twinkle Twinkle Little Star, that almost everyone can play to some extent in their first lesson. There is however content for all ages in this book and the majority of content is designed to be played by all ages. The book also takes a while to move onto chords. Like I said at the start of the post, I have developed some ‘Easy Reading’ books recently and at the time of updating this page for a new website launch (Jan 2019), I also have some ‘Easy Reading Chords’ ebooks in the pipeline, which have worked really well with my students. Check out the ebooks section and look for the Easy Reading Chords books – they’ll probably be available by the time you read this. The book is designed for use with teaching students with reading from as early as the first lesson if they are capable. All of the sheets are supposed to be achievable fairly quickly and easily by guitar and ukulele students of any age. Even students from the age of 5 or 6 could play some of these sheets. A teacher using this book would need to gauge the ability of the student. Often having something written down helps the student so even if they cannot read much of the music, they will be able to understand fret numbers and hopefully chord boxes too. The best thing about these books is that the guitar and ukulele versions are compatible so if you happen to have beginner guitar and ukulele students in the same group, then you will be able to use these books to play along together. I don’t have many of these groups and they don’t always have a lesson together, but sometimes it works really well to have guitar and ukulele students playing together or learning in a group. I hope that this book helps people get started quickly with learning guitar or ukulele and playing along to songs with others. The aim of this book is to progress quickly through it and to provide satisfaction through achieving. I hope to break down the barriers to getting started with learning guitar and ukulele with this book.